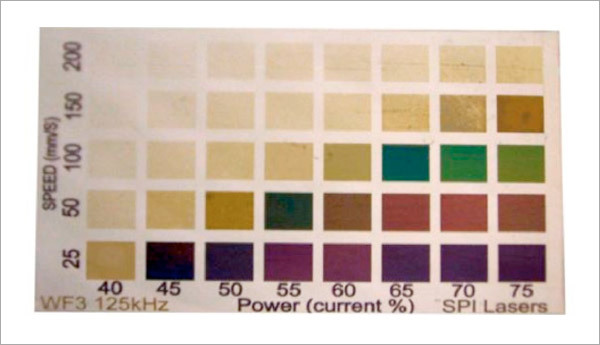 Colour marking is the controlled “growth” of a native metal oxide at the surface of the metal. Certain, more reactive, elements of the metal react with atmospheric oxygen to form a stable metal oxide. As has been seen in the published work of Worldwide Laser Service Corporation SPI Lasers were declared the best for the job, largely because the Laser provides the greatest flexibility in applying heat controllably to create bright colours without the limitations to darker hues impacted by heat accumulation. Range of pulse duration: In the redPOWER HS models, this ranges 10-200ns with 25 selectable waveforms. In the redENERGY EP models, this ranges 3-540ns with 40 selectable waveforms. 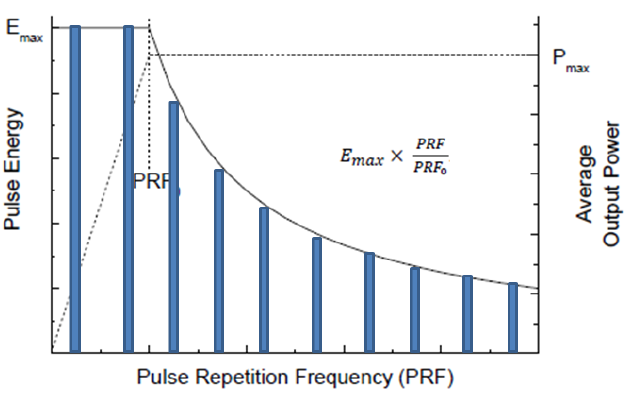 Range of pulse repetition frequency: All redPOWER HS and redENERGY EP models can operate from 1kHz to 1000kHz PRF. Additionally, each waveform of the Laser can be operated from 1kHz to a maximum PRF, typically between 500kHz and 1MHz. Of critical importance is the ability to run a specific waveform below its nominal frequency. For example, a 1mJ pulse creates 20W average power at 20kHz. Our diverse range of Lasers give you the flexibility to use that exact pulse shape and energy at lower PRF, for example, at 10kHz, the same waveform produces 10W average power, but each pulse still has the full energy, shape, peak power and duration as you would enjoy at PFR0 (20kHz, in this example). This feature allows you to dial in and separately optimise pulse duration, peak power, pulse energy and average power. The vast range of pulse durations and pulse repetition frequencies offered also provide the user with expanded possibilities when selecting scanner parameters. For example, you can control local heat input using faster scanning speeds and more passes, but only if the laser operates well at higher PRF (to keep the pulse overlap constant as you increase linear scan speed). Perhaps most importantly, you can change your Laser parameters (waveform selection, PRF, power) essentially on the fly (more practically, vector-to-vector). While the competition has developed MOPA Lasers to address our advantages, they did not do the same job implementing ease of control. As a result, most competitive offerings that provide more than one choice of pulse duration will require that you take the machine “down” and bring it up again in a different state to access the other pulse duration. By contrast, we do this within a few us simply by a change of the command inputs to your next marking vector. At the time of writing we are the only supplier offering a range of beam profiles (four, in fact) – ranging from single mode to a “soft” M2~3. For uniform colour marking, there are advantages to using a higher mode beam to avoid the central “hotspot” of a near-single-minded beam (any M2 less than 1.6 will have this hotspot). We also offer a range of four beam collimators to give more flexibility for designing the spot size on the marking surface, and for providing greater independence in the selection of the scanner optics (for example, you may want a longer theta to gain greater working area, and our longer collimators allow you to retain the spot size you would have had with tighter optics). Color marking is a very appealing application, but when taking it to production, becomes a significant multi-variable control challenge. Changes to material composition, thickness, heat-sinking, atmospheric temperature, air flow, Laser temperature – these can all affect the stability of the recipe you develop for a specific color. Our Lasers give you direct control at the finest level of the essential Laser parameters to allow you to quickly adjust to changes in your target or environment.